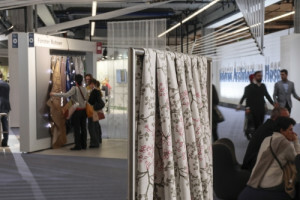 Trends and innovations for contract textile furnishing are at the heart of the Interior.Architecture.Hospitality Expo at Heimtextil 2019. New and particularly interesting for the hotel industry is the expansion of the bed-related product portfolio. Textiles are an integral part of comprehensive building planning and the hotel industry. In 2018 the Interior.Architecture.Hospitality. Expo was added, the focal point for contract furnishing. The supporting programme of Heimtextil consists of expert tours, informative lectures and the trend statement on material and interior design. The Interior.Architecture.Hospitality Expo is tailored to the needs of interior designers, hotel furnishers and planners. The latest aesthetic and functional solutions for contract furnishing will be presented: from textiles with acoustic function or special abrasion properties to modular carpets, sun protection and wall coverings. New will be the expansion of the bed-related product portfolio. At the Expo, hotel planners will also find bed systems, mattresses, bedding and linen that meet the special requirements of hotels. The overall design concept will be planned and implemented by Atelier Ushitamborriello from Switzerland. There are also innovative solutions for textile floor coverings in the contract sector. The lectures within the framework of the Interior.Architecture.Hospitality at Heimtextil cover a large spectrum of subjects from demographic influences on contract planning, via urbanisation, to the opportunities and visions opened up by digital printing in interior design. Additionally, there will be lectures for the first time under the heading ‘Printed Interior Decoration Lectures’. In cooperation with ESMA and Thomas Pötz, an internationally recognised expert in inkjet printing and experienced strategy consultant, specialists from the digital printing field will discuss the latest technologies and ways of customising wall and floor coverings and decorative fabrics in accordance with individual creative designs for contract furnishing. Printed Interior Decoration Lectures bring together technology suppliers and the creative world such as printers, designers and architects. At the last Heimtextil, contract furnishers were able to see and enjoy the abundance of future-oriented products and materials. The AIT Trend is a good indicator of the innovation potential offered by textiles in the field of interior design and contract furnishing. The award has been presented annually by the architecture magazine AIT at Heimtextil since 2011. On the first day of each trade fair, around 30 (interior) architects are out and about in the halls on behalf of AIT to track down the latest industry trends for AIT Trend Scouting. An expert jury then selects the prize winners from among the nominated products. The winners of the last edition were the Coex fibre of Maasberg from Germany, the recyclable organic artificial leather of Chieftain Fabrics from Ireland and the innovations of Drapilux that can air-condition rooms or dampen noise. 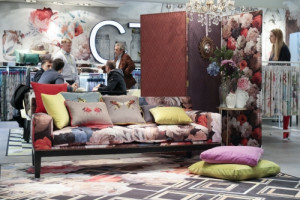 At Heimtextil 2019, contract furnishers will once again be expecting exciting new products, networking opportunities and inspiration for their work, especially in the context of the Interior.Architecture.Hospitality Expo.